Doctor Who: Stories From The Scrapheap - THE MENDAY FAULT | Warped Factor - Words in the Key of Geek. Christopher Morley dives into another story from the Doctor Who scrapheap. This latest morsel in our series of Stories From The Scrapheap finds the Fourth Doctor in territory his Second incarnation knew only too well! For The Menday Fault, originally submitted for Season Thirteen, is the tale of a nuclear submarine & its crew finding much more than they bargained for while exploring the Fault of Menday. The story represents what would have been quite a potential departure from the usual narratives Tom Baker found himself starring in during his seven-year stretch as captain of the good ship TARDIS. Had it been submitted at any point between 1966 & '69, though, it might have had more of a chance! The ' base under siege' narrative became par for the course for Patrick Troughton at the behest of then-producer Innes Lloyd, who suggested it as a cost-cutting measure enabling similar sets to be used multiple times, the new formula making its début in The Moonbase & subsequently recycled in various permutations for the likes of The Macra Terror ( which was also the first time we saw his rumpled face incorporated into the title sequence), Tomb Of The Cybermen, The Ice Warriors & The Seeds Of Death. Episode 2 - A creature enters through the hatch, subduing resistance by using a pressure weapon to squeeze several crew members to a pulp. 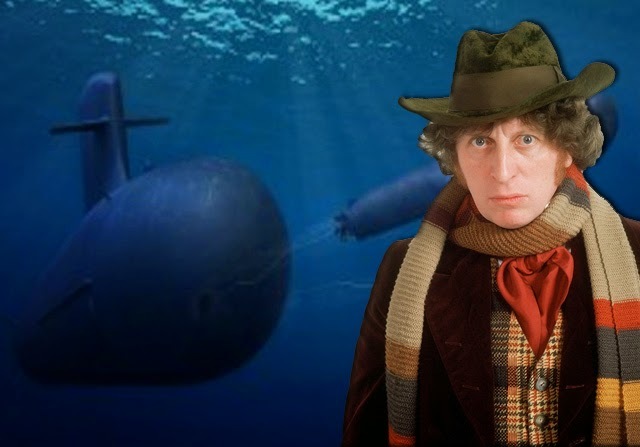 The Doctor theorizes that the submarine has penetrated an inner world within the Earth itself. The creature orders the crew to disembark, and they emerge into a world of blue grass, white trees and towering red buildings. Light radiates from a ‘sun’ of green incandescent gas. The Doctor is thrown into prison with the others. He is horrified by the threat posed by the Polaris missiles aboard the submarine; the underworlders’ sun is dying and they plan to use the missiles in an invasion against the surface world! The choice to situate the Fault of Menday within the Bermuda Triangle could have served to reopen the case into an ongoing mystery. The area also known as the ' 'Devil's Triangle'' has seen many a plane & ship disappear while passing through, with several theories as to why this may be. Take a look at journalist Vincent Gaddis' 1964 article ''The Deadly Bermuda Triangle'' for starters (found HERE). Add a pinch of The Underwater Menace, Fury From The Deep, Doctor Who & The Silurians & The Sea Devils & you have the essence of The Menday Fault!